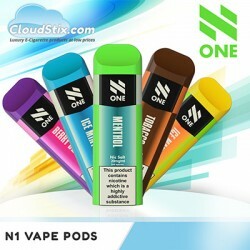 N-1 Disposable Vape Pods - Try Vaping with little cost. Already Vaping? Then why risk your setup on a night out when you could use one of these amazing little throw away Nic Salt Pods. The N1 Vape Pods are a fantastic disposable pod system that allow new customers to try vaping for the first time at very little cost. They are also perfect for any current user, especially on a night out, that does not want to lose a more expensive vape setup and want something stealthy yet packing a punch. The N1 Pods are so easy to use and take away any potential obsticles new vapers may find off putting when making the switch. From any given N1 Pod you will get appoximately 300 puffs before its time to discard the pod and use a new one. With a variety of devine flavours available you will never be stuck for choice. The N1 Pods have a very nice auto draw feature, meaning you simply inhale on the device and it will deliver a fine, smooth vapour. These pods are filled in the UK with premium smooth Nicotine salt e-liquid. Do not be fooled by the name, there is no salt in the juice. Nicotine salts or Nic Salts are simply a new way of manufacturing E-Liquid that allows for a higher dosage of nicotine to be delivered in a smooth and satisfying manner. Nic Salt E Liquid is rapidly abosorbed into the blood stream and so satisfies your Nicotine cravings quicker and lasts longer than regular E Liquid. The N1 Vaping pods are ideal for introducing tobacco smokers to the world of vaping or for those whom do not wish to risk an expensive setup when going out and about. With no refilling, no recharging and never a need to change a coil or build an atomizer its a simple yet powerful solution that should be embraced. We supply N1 Vape pods both on a wholesale level and to end users as we have sampled them well before launch date and love them very much. If you have any questions regarding this product then please do get in touch with our professional, friendly team.